VANCOUVER, British Columbia, Sept. 14, 2018 (GLOBE NEWSWIRE) -- Colorado Resources Ltd. (“Colorado” or the “Company”) (TSXV – CXO) is pleased to announce diamond drilling results from its 100% owned KSP property located in British Columbia’s prolific Golden Triangle region. 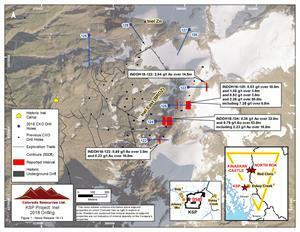 As previously announced on July 16, 2018, diamond drilling on the 308 sq. km KSP Property has tested two step-out targets around the historic Inel basin area, including the Big Rock Deformation Zone (BRDZ) to the east, and Inel Zn to the north. ¹ The Figures in this news release contain information about adjacent properties on which Colorado has no right to explore or mine. Readers are cautioned that mineral deposits on adjacent properties are not indicative of mineral deposits on the Company’s properties.